I recently came to know that many people are quite keen to experience the magic of a sunrise in Jaipur. People are on a hunt for the best sunrise points in Jaipur and includes travelers on a visit to Jaipur as well as nature loving Jaipur resident. Beautiful Sun rising over Jaipur. I thought of compiling this post for everyone’s benefit of the top places for sunrise in Jaipur. Some of the best places to witness a sunrise in Jaipur are not easily accessible to everyone since it involves an element of adventure, unpaved path, thorny bushes, and risk of wild animals among other things. While some people are fit and ready to undertake such adventure, others may not be in a position to do so. I’m refraining from listing such places for the reasons of safety. Following are the most popular places to witness the magic of a sunrise in Jaipur. Nahargarh Fort is the most popular place in Jaipur to watch a sunrise. It’s not surprising why it is so. Apart from sunrise, you can enjoy the beautiful Jaipur view from the top since it is perched over a hill overlooking the city. Nahargarh Fort offers one of the best of a rising sun in Jaipur. The sunrise point in Nahargarh Fort is on the east face near the Baori. It is close to the Baori where famous song Masti ki Pathshala from Bollywood movie Rang De Basanti was filmed. It’s known as Rang De Basanti shooting point or location. The Department of Archaeology managing the Nahargarh Fort has marked a different place for watching a sunrise. This is near the tri-junction of the road leading to the Baori. Here is a picture of the designated sunrise point. How To Reach Nahargarh Fort? There are significant distance and time involved in reaching Nahargarh Fort from the city. If you are a tourist, pick up service for your return journey might be an issue as there is no transport facility at Nahargarh Fort. Ensure that you book your taxi/tuk-tuk for return trip too or you can fix to pay waiting charges. Generally, drivers charge on two way basis even for one way drop. There are two ways to reach Nahargarh Fort. The most popular route is through the hill road which branches off from Amer Road just after Kanak Ghati. It’s a beautiful road which has stunning views of Jal Mahal or the Water Palace. The second option is through the Nahargarh walking route which starts in the Purani Basti area near Nahargarh Road. It takes anywhere 15-20 minutes for a fit person to traverse through this ramp. Do note that you will encounter filth, pigs, goat, and roosters at the starting point of this walking path to Nahargarh Fort. Most people prefer the first one. Take your pick. Watch out– Nahargarh Fort is one of the most popular hangout places for the city youth. Being a popular place for youth, don’t expect peace. Loud music, people running around the ramparts & creating noise is all a part and parcel of the “Nahargarh Sunrise Experience”. Don’t be surprised to find a huge crowd at Nahargarh Sunrise point even before the sunrise. Rash driving, tripling on a two-wheeler, and speeding are all part of this package! Nahargarh Fort and the road leading from Kanak Ghati has a reputation for being the biggest open-air Bar in Jaipur. It’s corroborated with the empty beer cans, broken liquor bottles, plastic wrappers of “Chakhna” littering the entire stretch of the roadside, all along. Watching the sunrise with loud music being played around or being run over by a speeding vehicle is not really my idea and this usually keeps me away from the Nahargarh Fort Sunrise. Jal Mahal or Water Palace is another popular sunrise point in Jaipur. What makes it so popular? The proximity to the main city is definitely one reason. Also, the sunrise is clearly seen from Jal Mahal as this is where the eastern hill range ends. One gets an uninterrupted view of the rising Sun. The entire setting is beautiful. There’s no extra effort involved in terms of driving, time or hill drive. For the tourists, services of the app-based service provider like Uber and Ola is also available. Majestic sunrise at Jal Mahal or Water Palace in Mansagar lake, Jaipur. Expansive wide-angle view of the sunrise at Jal Mahal, Jaipur. Jal Mahal is on Amer Road just before Kanak Vrindavan. From Johri Bazar it is approximately 4-4.5 Km and easy to spot. For tourists and visitors, the best option is to use Uber or Ola cab. Finding a Tuk-Tuk/ Auto-Rickshaw may be difficult during the early morning, your hotel may be able to assist you in finding one. 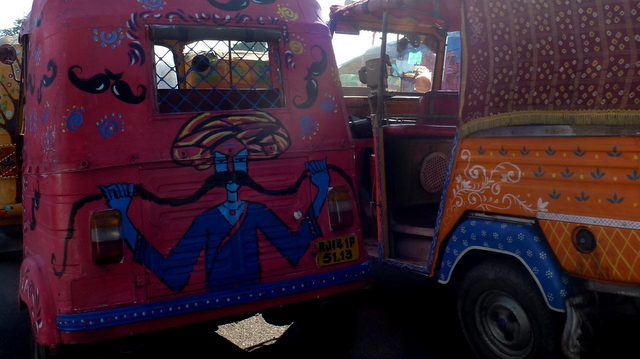 It is not difficult to find an e-rickshaw or tuk-tuk on your way back. Jal Mahal is also connected via local bus service which connects Badi Chaupar near Hawa Mahal/ Johari Bazar to Amer. Watch out – It’s never crowded at Jal Mahal during this hour but you might come across the group of boys residing in the vicinity using language which is far from desirable. Chances of such experiences occurring during morning hours are less likely, though. Sometimes, the stench from the water might be a turn-off. Many people dump bread, biscuit, and wheat dough in the lake to feed fishes. Although they might be doing so for earning good Karma, it ends up polluting the lake. Is Nahargarh Fort Best Sunset Point in Jaipur? I hope this post will help nature lovers experience the glory of a sunrise in Jaipur. I will continue to share pictures of sunrises for Jaipur Sky. Pingback: All About Nahargarh Fort Sunrise Experience – Jaipur Thru My Lens !! Beautiful post and pictures!! Thank you! Thanks, Valerie! I’m glad you liked it. Do you love sunrises? Yes, but I don’t often see them! Mostly sunsets! Thank you, Nihar. You are right that location makes all the difference. Another perspective is the presence of clouds. I agree with your statement that places with vantage point make all the difference. Sunrise and sunset both are beautiful. It is all about you being there. Some people find it difficult to get up early. For me, experiencing a sunset is kind of difficult because I’m busy at work. In the end, it is all about what works for you. I remember that you are into walking and running. I’m hoping you do get to watch a sunrise on a regular basis! Do you? I agree it is all about what works for us…yes I am into walking and love to go out in the morning in different places, and the sunrise in a valley in different from the sea beach…and so does it goes with the sunset. Thanks for sharing with us such delightful places dotted across the Pink city. Happy to hear that you take your health seriously, Nihar. I’m sure sunrise and sunset is an added bonus. In which city do you reside? Mumbai? Writing gets a lift when you shift your focus from work routines and go for a walk, that’s another motivation that keeps me driving towards the nature…health definitely remains the primary driver. Awesome picture, Arv. I’m planning to go the Rajasthan trip. Could you tell me please the best time for it? Oct to March is what everyone thinks. I feel mid December to mid February is a good time. I’m​ hoping you enjoy winter season and cold weather. Nice coverage. Helpful for a person visiting Jaipur. I love to watch the sun rise. Great photos. Wow! Lovely photos. I have never visited Jaipur but am planning to do soon. Your blog is going to come very handy! These are some amazing pics of the sunrise… I love watching sunrises and the peace and quiet at that time of the day… an great compilation here! I’m glad that you liked it. Do you watch sunrise regularly? I especially love the reflection on the water!